April 13. The soldiers arrive. It is April 13th, the 66th anniversary of the liberation. 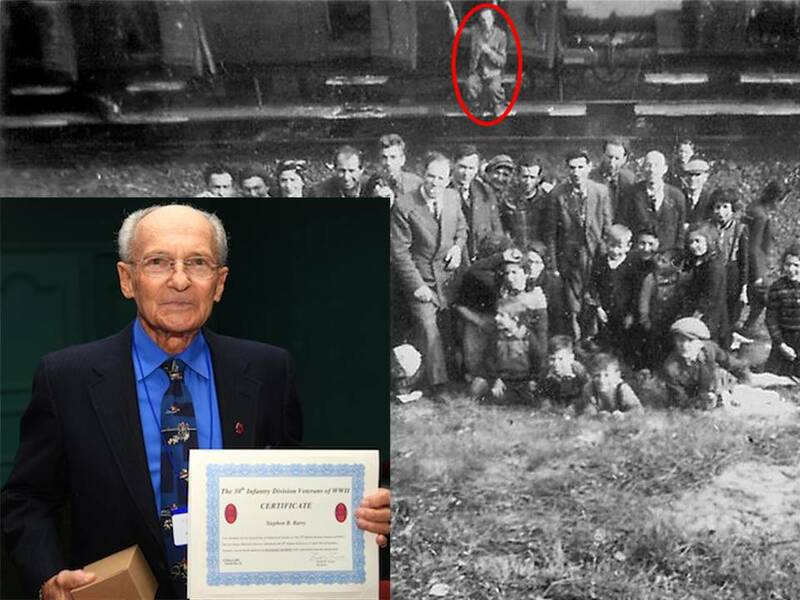 And in no small coincidence, I have been granted approval to travel to Israel with liberator Frank Towers to meet over 50 survivors of the train near Magdeburg liberated on this day in 1945. Read below the moving narrative of Dr. George C. Gross, his remembrance of the liberation day, written 10 years ago, before he was aware of any of the survivors. 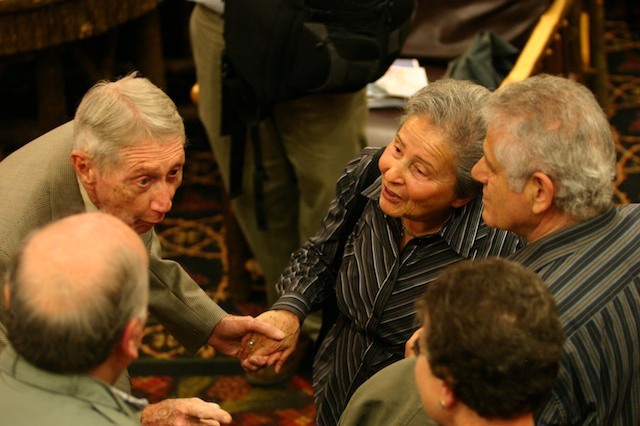 He got to know quite a few before he passed on Feb. 1, 2009. Greetings to all the survivors on the day of your rebirth, and to the soldiers who, in “just doing our jobs”, saved the world. There was another sidelight to the death of fascism in Europe. Only a few of the battalion saw it. Those who did will never forget it. A few miles northwest of Magdeburg there was a railroad siding in wooded ravine not far from the Elbe River. Major Clarence Benjamin in a jeep was leading a small task force of two light tanks from Dog Company on a routine job of patrolling. The unit came upon some 200 shabby looking civilians by the side of the road. There was something immediately apparent about each one of these people, men and women, which arrested the attention. Each one of them was skeleton thin with starvation, a sickness in their faces and the way in which they stood-and there was something else. At the sight of Americans they began laughing in joy-if it could be called laughing. It was an outpouring of pure, near-hysterical relief. The tankers soon found out why. The reason was found at the railroad siding. There they came upon a long string of grimy, ancient boxcars standing silent on the tracks. In the banks by the tracks, as if to get some pitiful comfort from the thin April sun, a multitude of people of all shades of misery spread themselves in a sorry, despairing tableaux [sic]. As the American uniforms were sighted, a great stir went through this strange camp. Many rushed toward the Major’s jeep and the two light tanks. Bit by bit, as the Major found some who spoke English, the story came out. This had been-and was-a horror train. 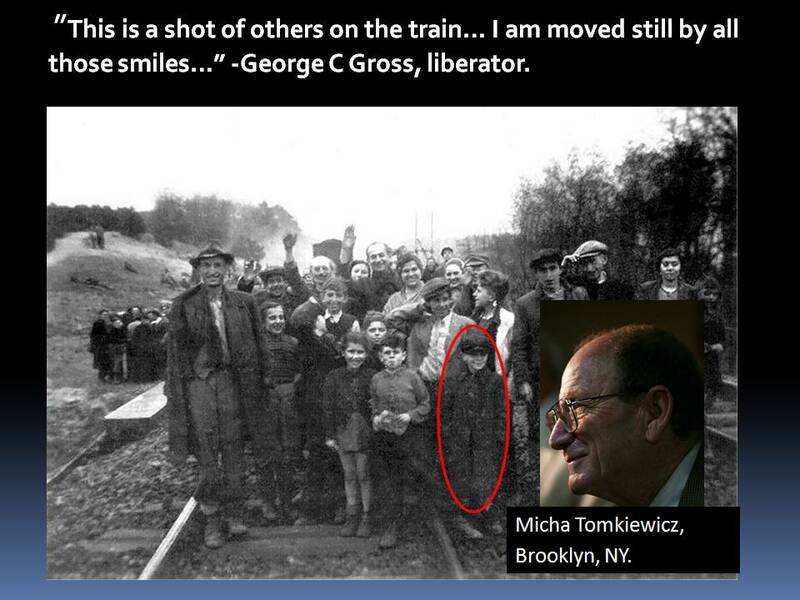 In these freight cars had been shipped 2500 people, jam-packed in like sardines, and they were people that had two things in common, one with the other: They were prisoners of the German State and they were Jews. These 2500 wretched people, starved, beaten, ill, some dying, were political prisoners who had until a few days before been held at concentration camp near Hanover. When the Allied armies smashed through beyond the Rhine and began slicing into central Germany, the tragic2500 had been loaded into old railroad cars-as many as 68 in one filthy boxcar-and brought in a torturous journey to this railroad siding by the Elbe. They were to be taken still deeper into Germany beyond the Elbe when German trainmen got into an argument about the route and the cars had been shunted onto the siding. Here the tide of the Ninth Army’s rush had found them. They found it hard to believe they were in friendly hands once more: they were fearful that the Germans would return. They had been guarded by a large force of SS troopers, most of whom had disappeared in the night. Major Benjamin, knowing there were many German Army stragglers still in the area, left one of the light tanks there with its accompanying doughboys as a protective guard. The Major then returned to Division headquarters to report the plight of these people. For 24 hours, the crew of the tank remained on watch as their charges streamed about the vehicle, crying and laughing their thanks of rescue, and those who could told stories of slavery, oppression, torture, imprisonment, and death. To hear their stories, to see before them the results of inhuman treatment lifted still another corner of the cover which, on being removed, exposed the full cruel spirit of Nazism which permitted such things to be. And this was but one of the many such stories being brought to light as Allied soldiers ripped into the secrets of Adolph Hitler’s Third Reich. The train needed some badly needed food that night. More, the promise of plentiful food the next day was given to them. The commanding officer of the 823rd Tank Destroyer Battalion was seeing to it that such food would be available. He had ordered German farmers of the surrounding towns to stay up all night, if necessary, to get food to these people. 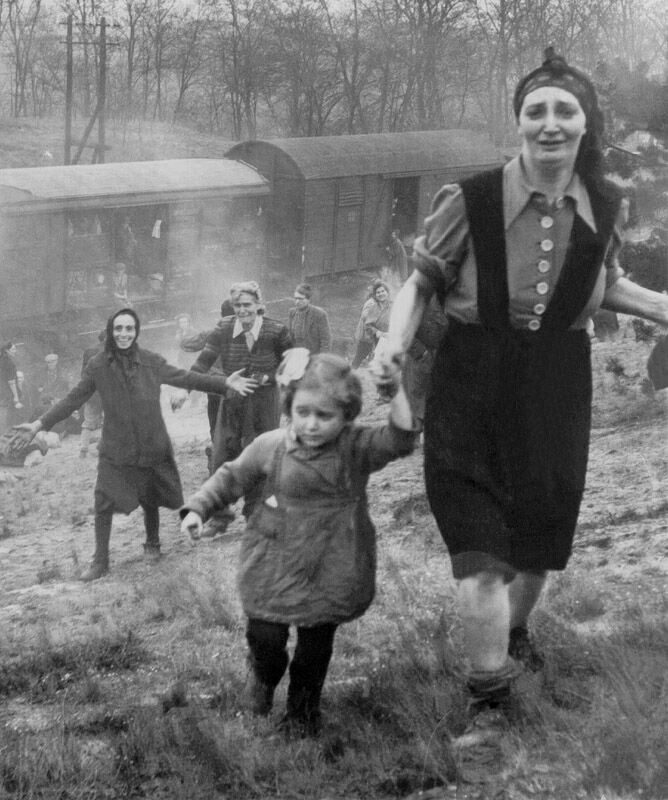 Other Americans concerned themselves with locating living quarters to get the concentration camp victims away from the evil-smelling freight cars before more of them died and were covered by a blanket or just left lying in their last sleep beside the railroad tracks. On Friday, April 13, 1945, I was commanding a light tank in a column of the 743rd Tank Battalion and the 30th Infantry Division, moving south near the Elbe River toward Magdeburg, Germany. 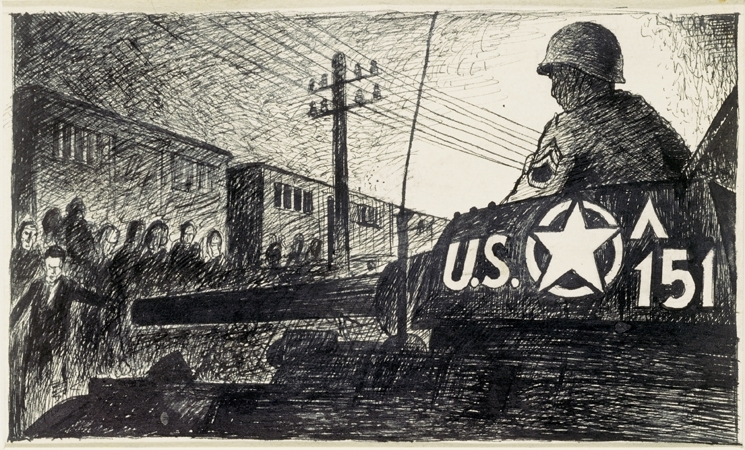 After three weeks of non-stop advancing with the 30th from the Rhine to the Elbe as we alternated spearhead and mop-up duties with the 2nd Armored Division, we were worn out and in a somber mood because, although we knew the fighting was at last almost over, a pall had been cast upon our victories by the news of the death of President Franklin D. Roosevelt. I had no inkling of the further grim news that morning would bring. Suddenly, I was pulled out of the column, along with my buddy Sergeant Carrol Walsh in his light tank, to accompany Major Clarence L. Benjamin of the 743rd in a scouting foray to the east of our route. Major Benjamin had come upon some emaciated Finnish soldiers who had escaped from a train full of starving prisoners a short distance away. The major led our two tanks, each carrying several infantrymen from the 30th Infantry Division on its deck, down a narrow road until we came to a valley with a small train station at its head and a motley assemblage of passenger compartment cars and boxcars pulled onto a siding. There was a mass of people sitting or lying listlessly about, unaware as yet of our presence. There must have been guards, but they evidently ran away before or as we arrived, for I remember no firefight. Our taking of the train, therefore, was no great heroic action but a small police operation. The heroism that day was all with the prisoners on the train. es toward us. In a moment, that woman found a pack left by a fleeing German soldier, rummaged through it, and held up triumphantly a tin of rations. She was immediately attacked by a swarm of skeletal figures, each intent upon capturing that prize. My yelling did no good, so that I finally had to leap from my tank and wade through weak and emaciated bodies to pull the attackers off the woman, who ran quickly away with her prize. I felt like a bully, pushing around such weak and starving fellow humans, but it was necessary to save the woman from great harm. The incident drove home to me the terrible plight of the newly freed inhabitants of the train. I pulled my tank up beside the small station house at the head of the train and kept it there as a sign that the train was under American protection now. 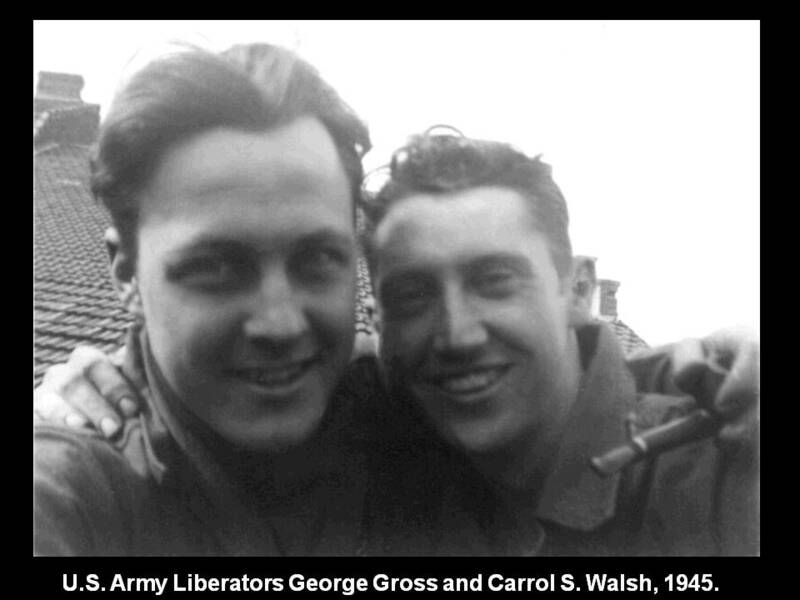 Carroll Walsh’s tank was soon sent back to the battalion, and I do not remember how long the infantrymen stayed with us, though it was a comfort to have them for a while. My recollection is that my tank was alone for the afternoon and night of the 13th. A number of things happened fairly quickly. We were told that the commander of the 823rd Tank Destroyer battalion had ordered all the burgermeisters of nearby towns to prepare food and get it to the train promptly, and were assured that Military Government would take care of the refugees the following day. So we were left to hunker down and protect the starving people, commiserating with if not relieving their dire condition. I believe that the ranking officer of the Finnish prisoners introduced himself to me and offered to set up a perimeter guard. I think I approved and asked him to organize a guard, set out pickets, and handle the maintenance and relief of the outposts. However it happened, the guard was set up swiftly and efficiently. It was moving and inspiring to see how smartly those emaciated soldiers returned to their military duties, almost joyful at the thought of taking orders and protecting others again. They were armed only with sticks and a few weapons discarded by the fleeing German guards, but they made a formidable force, and they obviously knew their duties, so that I could relax and talk to the people. A young woman named Gina Rappaport came up and offered to be my interpreter. She spoke English very well and was evidently conversant with several other languages besides her native Polish. We stood in front of the tank as along line of men, women, and little children formed itself spontaneously, with great dignity and no confusion, to greet us. It is a time I cannot forget, for it was terribly moving to see the courtesy with which they treated each other, and the importance they seemed to place on reasserting their individuality in some seemingly official way. Each would stand at a position of rigid attention, held with some difficulty, and introduce himself or herself by what grew to be a sort of formula: the full name, followed by “a Polish Jew from Hungary”-or a similar phrase which gave both the origin and the home from which the person had been seized. Then each would shake hands in a solemn and dignified assertion of individual worth. Battle-hardened veterans learn to contain their emotions, but it was difficult then, and I cry now to think about it. What stamina and regenerative spirit those brave people showed! Also tremendously moving were their smiles. I have one picture of several girls, specter-thin, hollow-cheeked, with enormous eyes that had seen much evil and terror, and yet with smiles to break one’s heart. Little children came around with shy smiles, and mothers with proud smiles happily pushed them forward to get their pictures taken. I walked up and down the train seeing some lying in pain or lack of energy, and some sitting and making hopeful plans for a future that suddenly seemed possible again. Others followed everywhere I went, not intruding but just wanting to be close to a representative of the forces that had freed them. How sad it was that we had no food to give immediately, and no medical help, for during my short stay with the train sixteen or more bodies were carried up the hillside to await burial, brave hearts having lost the fight against starvation before we could help them. The boxcars were generally in very bad condition from having been the living quarters of far too many people, and the passenger compartments showed the same signs of overcrowding and unsanitary conditions. But the people were not dirty. Their clothes were old and often ragged, but they were generally clean, and the people themselves had obviously taken great pains to look their best as they presented themselves to us. I was told that many had taken advantage of the cold stream that flowed through the lower part of the valley to wash themselves and their clothing. Once again I was impressed by the indomitable spirits of these courageous people. 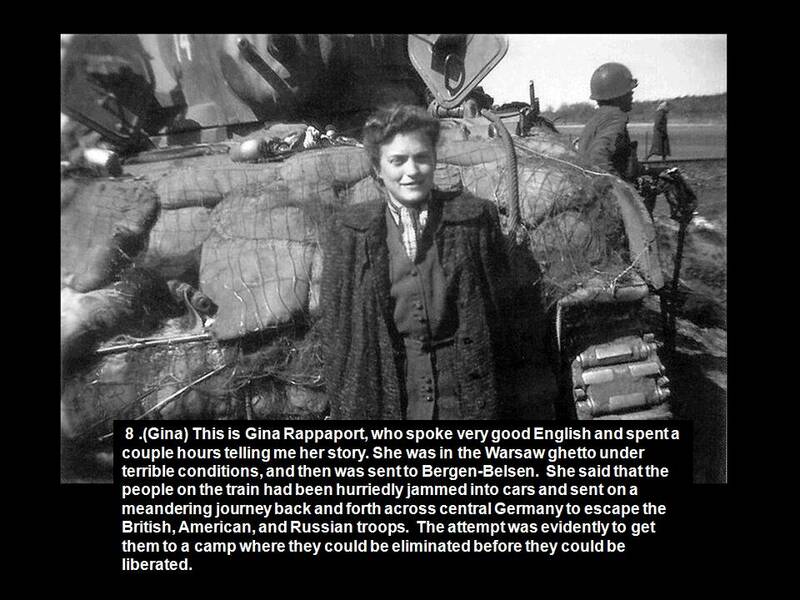 I spent part of the afternoon listening to the story of Gina Rappaport, who had served so well as interpreter. She was in the Warsaw ghetto for several years as the Nazis gradually emptied the ghetto to fill the death camps, until her turn finally came. She was taken to Bergen-Belsen, where the horrible conditions she descri bed matched those official accounts I later heard. 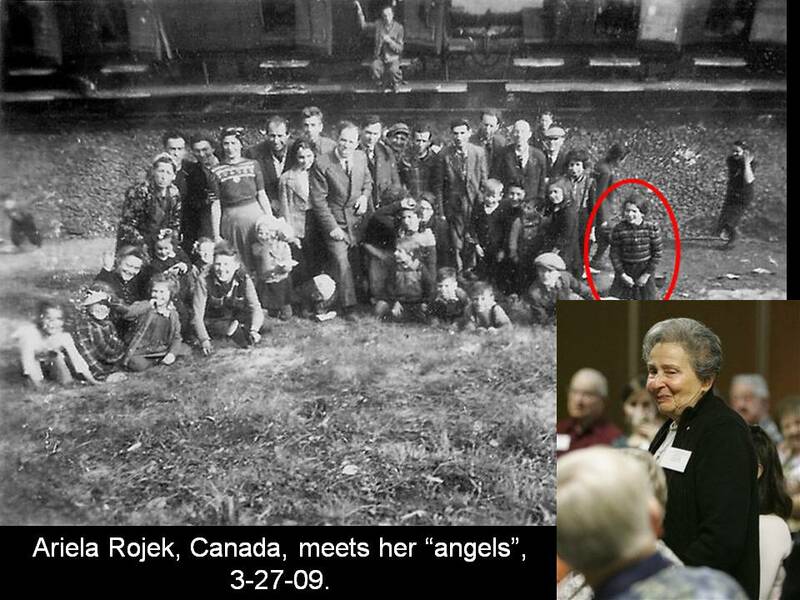 She and some 2500 others, Jews from all over Europe, Finnish prisoners of war, and others who had earned the enmity of Nazidom, were forced onto the train and taken on a back-and-forth journey across Germany, as their torturers tried to get them to a camp where they could be eliminated before Russians on one side or Americans on the other caught up with them. Since the prisoners had little food, many died on the purposeless journey, and they had felt no cause for hope when they were shunted into this little unimportant valley siding. 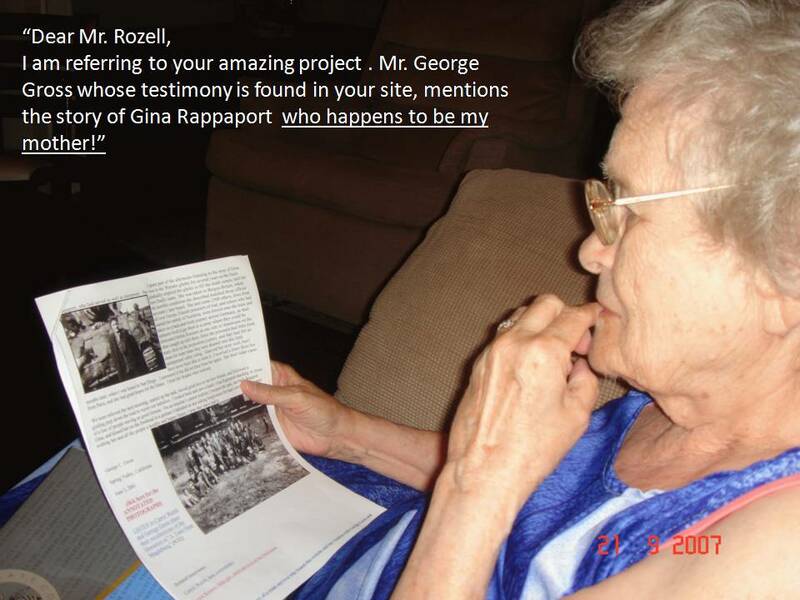 Gina told her story well, but I have never been able to write it. I received a letter from her months later, when I was home in San Diego. I answered it but did not hear from her again. Her brief letter came from Paris, and she had great hopes for the future. I trust her dreams were realized. We were relieved the next morning, started up the tank, waved good-bye to our new friends, and followed a guiding jeep down the road to rejoin our battalion. I looked back and saw a lonely Gina Rappaport standing in front of a line of people waving us good fortune. On an impulse I cannot explain, I stopped the tank, ran back, hugged Gina, and kissed her on the forehead in a gesture I intended as one asking forgiveness for man’s terrible cruelty and wishing her and all the people a healthy and happy future. I pray they have had it.